People with a penchant for beauty oils, are no doubt, well aware of the iconic NUXE Paris Dry Oil Huile Prodigieuse, and it is a definite must-have for luxury beauty oil enthusiasts. 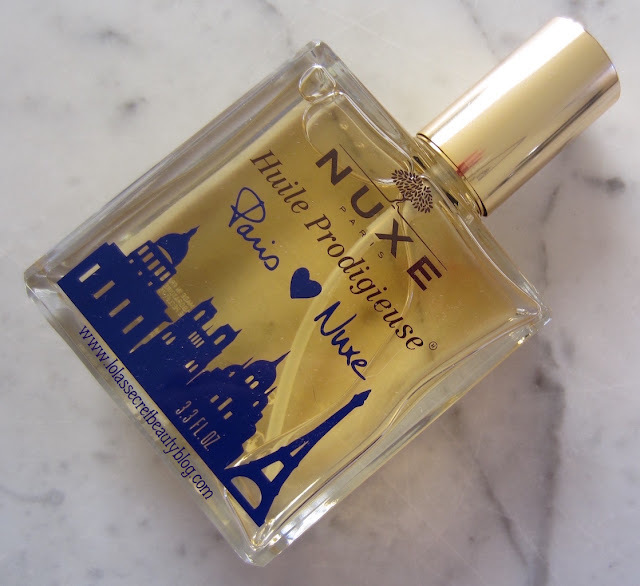 If you have been wanting to try it, or need to replenish your supply, then the NUXE Paris Dry Oil Huile Prodigieuse Paris Limited Edition offers a stunning keepsake bottle for this exemplary multipurpose beauty oil. NUXE Paris Dry Oil Huile Prodigieuse is a delectable smelling dry oil that is formulated for use on the face, body and hair. The aroma, which might be described as a warm nutty floral, is so beloved that it inspired NUXE to create an eau de parfum that captured its intoxicating scent. Huile Prodigieuse is a multipurpose dry oil that nourishes, hydrates, softens and repairs dry skin and hair. It has a lightweight, fast absorbing texture that immediately transforms dry skin into soft, supple, nourished skin with pronounced luminosity. It leaves hair soft, silky smooth and shiny– while it tames frizz. I also find Huile Prodigieuse particularly effective for dry hands, cuticles and feet, and for that reason I leave a bottle on my nightstand in order to use it nightly before falling asleep. NUXE selected particularly nourishing plant and nut oils such as Macadamia, Hazelnut, Borage, Sweet Almond, Camellia and St. John's Wort, because they efficiently nourish, repair and soften skin and hair. Tips from NUXE: "Blend a few precious drops in with your favorite cream or serum. Spritz on wet hair to impart an effortless just-out-of-the-shower style, blend into foundation for a dewy finish and get an extra glow by mixing dry oil Huile Prodigieuse with your favorite moisturizer. A light spray before applying a face mask will give your skin a burst of moisture." I have used Huile Prodigieuse in all of the aforementioned ways– except I have yet to apply it prior to masking, but I plan to try that next. Star product Huile Prodigieuse Dry Oil for face, body and hair embodies the brand’s philosophy, a blend of pleasure and efficacy in a voluptuously addictive experience. With its unique dry texture, not only does it nourish, repair and soften face, body and hair, it also smells and feels great. Its secret natural formula of precious botanical oils and plant extracts combines effortless beauty with immediate results and a touch of indulgence, ensuring its star status among women. Nuxe harnesses the powers of nature to make all women feel prodigiously beautiful. 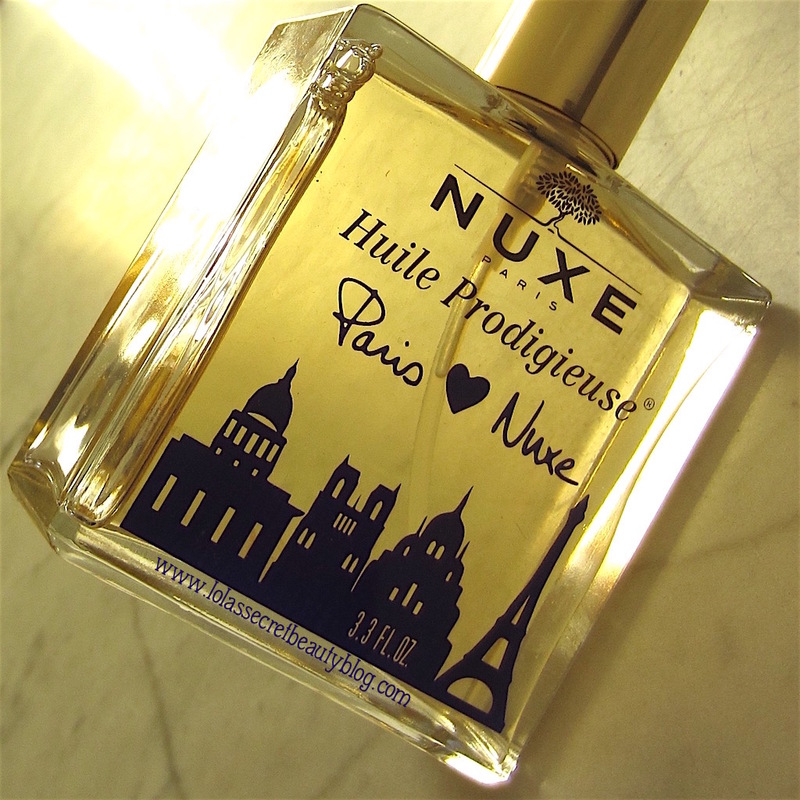 There’s no mystery behind Nuxe’s success—the brand simply delivers on its promises of Parisian natural beauty. Dry oil Huile Prodigieuse and its sister, the shimmering dry oil Huile Prodigieuse Or (for a golden, sun-kissed look) are more than classics, they have become an integral part of every self-respecting Parisian woman's beauty regimen—no bathroom cabinet is complete without it! Borrow a few tips from her beauty routine: this multi-usage dry oil Huile Prodigieuse is a treat on its own, or it can replace your face, body and hand cream. Contains at least 97.8 % of natural origin ingredients. No Preservatives. $45.00 & £28 for 3.3 oz. from NUXE US, NUXE UK, Space NK UK, Beautyhabit, Beauty Expert, Escentual, Mankind, HQ Hair and Look Fantastic (Affiliate Links). 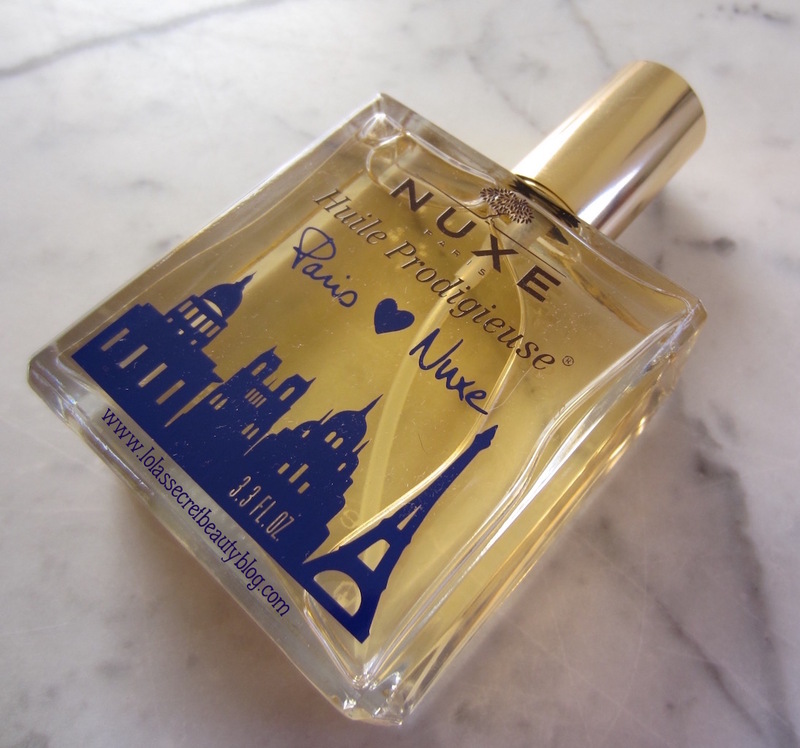 This dry oil from Nuxe sounds absolutely lovely, Helen! First off, I adore the bottle design. The Paris icons are so cute! After reading your review, I ran off to find the deluxe Nuxe sample of oil that I received in a recent Birchbox - it's gotta be here somewhere!! Thank you, Allison! I am glad that my review sent you searching for that sample. I suspect that you will love it, given the similarity of our taste in skincare products! I can't wait to hear what you think! I agree, the bottle is fantastic, and I will definitely reuse it when I finish up the contents! That packaging is seriously so chic. It definitely is, and the contents are FAB! I just love the bottle! Me too– in fact I will definitely refill the bottle with something else when I finish it up because it is just too fab to recycle! I used to get so many of these in boxes but that was then. Now that I'm willing to try some fragranced items I no longer get the Nuxe. But I will try it one day after all your raves. It's funny how that sometimes happens! I am so thrilled that you have found a beauty oil with fragrance that you can use, and I definitely want to try that one now! 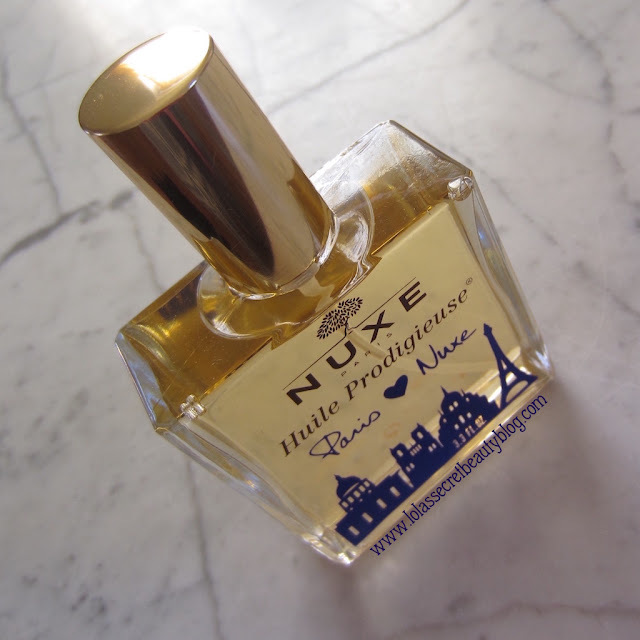 I hope that you get a few samples of the NUXE oil because I really think that you would like it a lot! This oil sounds like pure heaven. I love oils, can't get enough of them for face, body or my hair and the scent sounds intoxicating. The price isn't outrageous... Maybe I'll treat myself. Then you really,really need to try this one, Erika! The price definitely isn't outrageous, and it is really a very lovely dry oil! The bottle is so cute! I have bought this oil for my mom (who is an oil fanatic) but never actually tried it for myself. I think I need to *borrow* a little. Isn't the bottle fantastic?! I will definitely reuse it once I finish the oil! It's just to fabulous to toss in the recycle bin! You definitely need to "borrow" a little from your mom, I suspect that you will love it! Then you will REALLY love this one, twinsy! I absolutely LOVE Nuxe Dry Oil and will never be without it. It is the only oil I can apply to my hair and not get a stiff neck! I agree, it really is a fabulous dry oil! I have used it for years, and never want to be without a bottle! I got a full size of this oil in my last Glossybox, it's so nice! Wow, that's awesome, Julie! I am so glad that you like it! I love dry oils for my split ends! Always makes my hair feel so much better! I love using this I'm my hair as well! I have been dying to try this. I just read about it somewhere and have it on my list. As much as you love oils, this one should definitely be on your list! 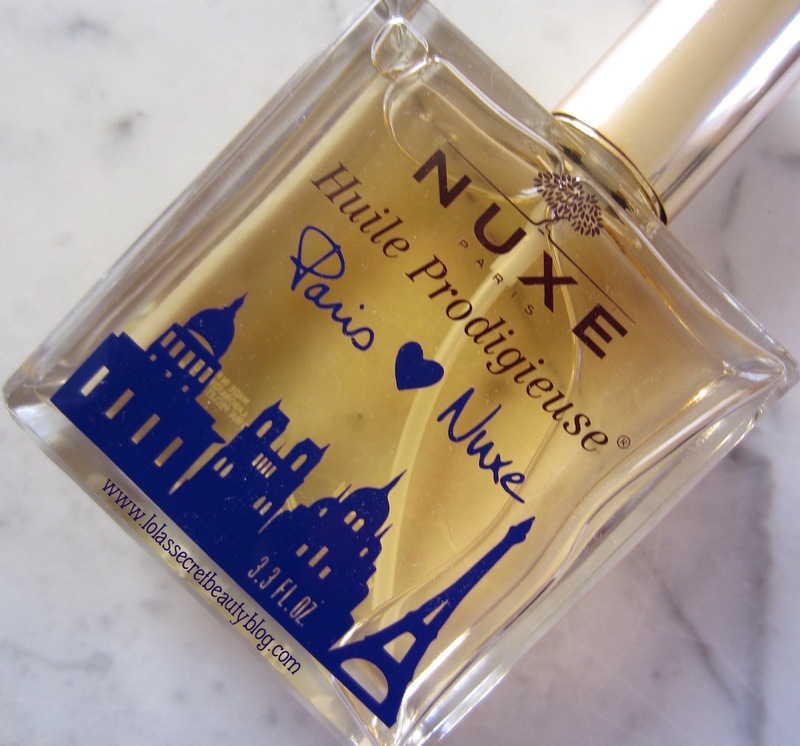 I love dry oils and the scent of the Nuxe oil is so amazing!! I need to get more some day. If you love dry oils, then this one definitely needs to be on your must-try list! The smell is utterly delectable! Hi, I haven't tried to open it because I have been finishing up an older bottle first. Please let me know if you figure out how to open it– because I definitely want to keep the bottle as well! I am so glad that you love it, I do too!